Alain invited me to watch the fireworks display at Bishops Park (in the London Borough of Hammersmith and Fulham) with his family and then dinner afterwards since they live close to the park. Alain was my team leader. After our application got released and cleared by System Test last March, the whole team got disbanded. Two went to another project (now working in other locations of Logica) and while the three of us are still on the same project, we are now assigned to different teams. Even so we still have coffee breaks everyday, we bonded maybe because our nationalities both start with an F... he's French and I'm Filipino (oh diva :-|). Sometimes when the Spaniard Carlos (one of the three) is not working from home, he usually joins our coffee bonding. Last night was the fireworks display - an annual event that occurs during the weekend of Guy Fawke's night. Remember, remember the fifth of November, the gunpowder treason and plot. I know of no reason why the gunpowder treason should ever be forgot? What you don't know that? It's a famous English nursery rhyme, and like all nursery rhymes it has a dark hidden meaning. It talks about Guy Fawkes and his co-conspirators' plan to kill the king (King James I) by blowing up the Houses of the Parliament, also called as the Gunpowder Plot of 1605. Guy Fawkes was caught red-handed on November 5, 1605 beneath the vaults of the House of Lords on the verge of igniting barrels of gunpowder. He was then hanged, drawn and quartered. That is, he was dragged on a wooden frame to the place of execution, hanged by the neck for a short time or until almost dead (hanged), disembowelled and emasculated and the genitalia and entrails burned before his eyes (drawn) and the body divided into four parts then beheaded (quartered). Tsk tsk, that punishment was quite harsh! Guy Fawkes’s night or Bonfire Night is an annual celebration on the evening of November 5, to celebrate the foiling of the Gunpowder Plot. Fireworks and bonfires are lit in many parts of Great Britain. Guy Fawkes is also the inspiration of the movie V for Vendetta. So last night was an extension of the Guy Fawkes's night. I got to meet Alain's lovely wife (Ann Veronique), his two cute and really pretty daughters (Eve and Penelope), and also his daughters’ friends (Sky and Hope). I also met their Italian au pair (Janice). Au pair is a French term of a young woman or a young man from a foreign country who chooses to help look after the children of a host family. He/she is given room and board and paid weekly salary. He/she usually is given a one year contract. Students here in Europe (I don’t know in US) after graduating from secondary school opt to rest for a year and live in a foreign country before going straight to the University – maybe to use that time for soul searching as to what to pursue as a profession. So to have a pocket money, they can do au pair-ing. There are sites where they can post their resumes so couples looking au pair can browse them. Some couples here prefer an au pair to a nanny because the latter is very expensive since it is considered a profession here. I spent a lot of time talking with Janice during the fireworks because she’s just 22 - parang magka-edad lang kami :p She was very happy to converse with me because she wanted to practice her English. She's taking care of Eve and Penelope only 3 to 4 hours a day during the afternoons when they come home from school, while waiting for Alain and his wife to come home from work. Since she's free in the mornings she decided to go to an English school. She's fluent in French as she studied it before for 8 years. She said after mastering English, she'll study Spanish because she wants to be an interpreter by profession. After the fireworks we went to Alain’s house and I was introduced to Sky and Hope's parents. Sky and Hope were to sleepover there. Ann Veronique told me that Eve (their youngest daughter) was very excited, spent the whole week looking forward to it because it's her first time to have a friend for a sleepover. She told me girls here usually start inviting their friends and getting invites of sleepovers around 3rd grade. Hmmm that's one way to know kung sikat ka pag marami kang invites na natanggap. After both couples sent their kids to bed, we finally had our dinner. Gosh around 9 na yun, kumakalam na sikmura ko - tapos unang sinerve e wine pa! But the dinner was worth the wait. 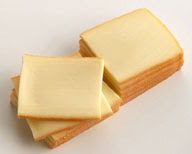 The French couple served us Raclette - a French dish made by melting a kind of cheese of the same name on a hot plate and then pouring the melted cheese on slices of boiled baby potatoes and then you can eat it together with cold cuts. It was heavenly - ang sarrrapppp! Too bad I didn't take pictures. Nahiya kasi ako baka they would find it rude clicking photos while we're in the middle of a classy dinner (classy kasi aside from wine, we had table napkins! :p). Ayoko kaya ma kick out, sarap ng food noh! The 2 couples were very polite, they included me in their conversations kahit wala akong alam about school uniforms and their daughters' teachers. We closed the evening with a yummy dessert baked by Melissa (Sky and Hope's mother). I had a great time. It was already 1:00 AM when I got home. 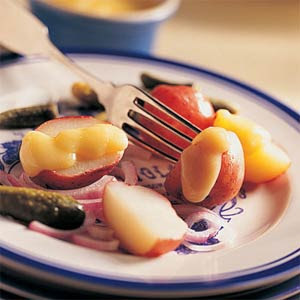 Here are pics of a Raclette I got from the internet. and how it is to be eaten. 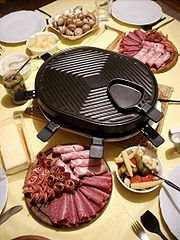 I think we can do something like this even without using a fancy Raclette equipment.